The definitive texts on Golden Coast Airlines are found in Graeme McConnel's chapter in "Taking Off - Pioneering Small Airlines of New Zealand 1945-1970" by Richard Waugh, Bruce Gavin, Peter Layne and Graeme McConnell and in Bruce Gavin's chapter on air service operators to the West Coast in "Hoki to Haast" by Richard Waugh. This first post draws largely on their work while the second post is drawn largely from my research in the Greymouth Evening Star. 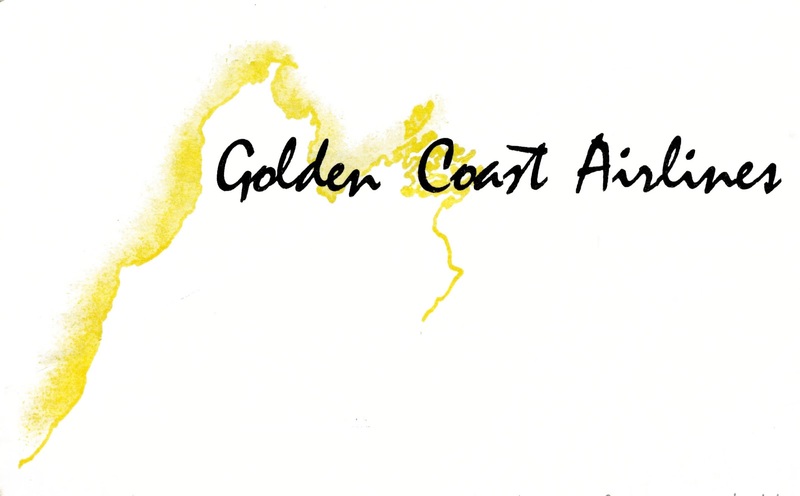 Golden Coast Airways was established by Bill Evans in 1960 to operate an air taxi and charter operation between Nelson and Karamea. Initially the company used an Auster J/1B Aiglet, ZK-AWZ (c/n 2669), and a De Havilland 82A Tiger Moth, ZK-BAT (c/n 82139). 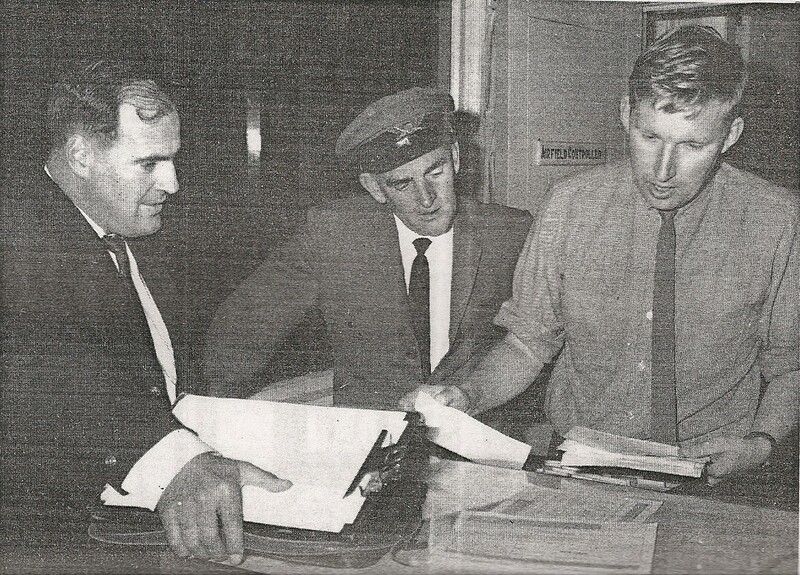 With Karamea being quite isolated there was a lot of local interest in an air service to Nelson. 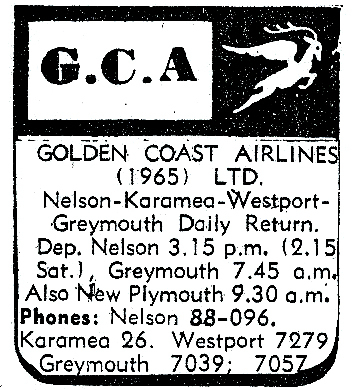 Capitalising on this Bill Evans arranged a contract to carry the Nelson Evening Mail to Karamea and enabling the establishment of a Monday to Friday service between Nelson and Karamea on the 1st of September 1960. The departure time from Karamea to Nelson was flexible allowing a time to suit local passengers while the return flight to Karamea left Nelson at 4.10pm arriving at 4.45pm. Bill Evans was an entrepreneur who was skilled at finding a load and so the service grew in popularity. The Auster soon became too small and negotiations were made with the Nelson Evening Mail to guarantee a loan enabling the purchase a more modern Cessna 180, ZK-BFD (c/n 30867). With the introduction of the Cessna 180 in late 1960 the Tiger Moth was sold. The Cessna 180, being larger than the Auster enabled the extension of the service south to Westport from the 27th of December 1960. The availability of the Nelson Evening Mail in Westport, made possible by the extended air service, meant competition for the local newspaper, The News, which struggled to compete. The Nelson Evening Mail took the opportunity to purchase the News. Printing of the newspaper was moved to Nelson and the paper was flown to Westport each day. This led to Golden Coast Airways needing to purchase a larger Cessna 185 Skywagon, ZK-CAK (c/n 185-0017). CAK was the first Cessna 185 registered in New Zealand and it entered service on the 4th of August 1961. Its introduction led to the sale of the Auster. ZK-CAK was a larger 6-seater Cessna 185. It is seen above photographed at Nelson shortly after its arrival and below after it was repainted in Golden Coast Airways colour scheme. Further expansion occurred in 1963 when the company purchased Piper Pa23-160 Apache ZK-BYB (c/n 23-1828). 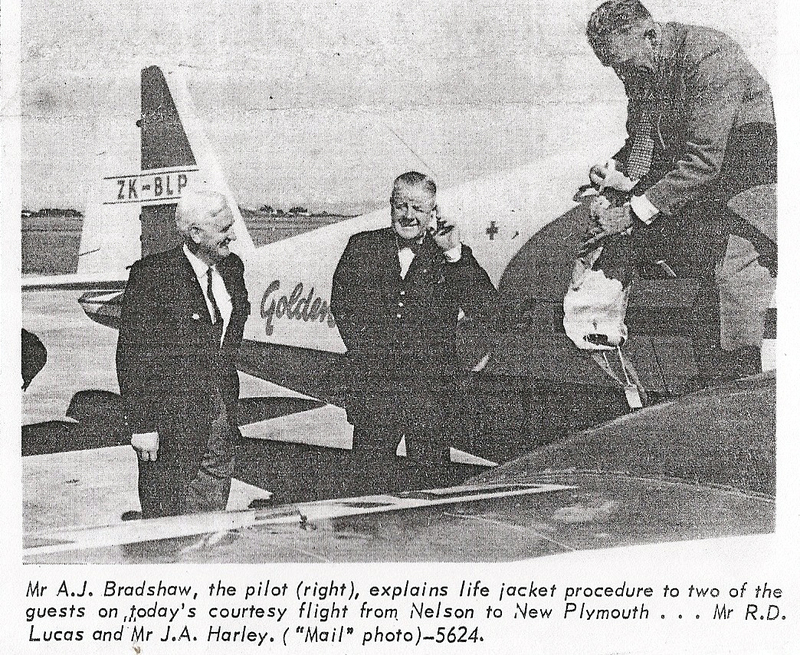 With the arrival of the Apache the Cessna 185 was sold to Cookson Airspread of Wairoa and, as part payment, Golden Coast received from them Cessna 180 ZK-BVQ (c/n 31342). The addition of the Apache enabled the extension of Nelson-Karamea-Westport service south to Greymouth. The extended service began on the 11th of July 1963. 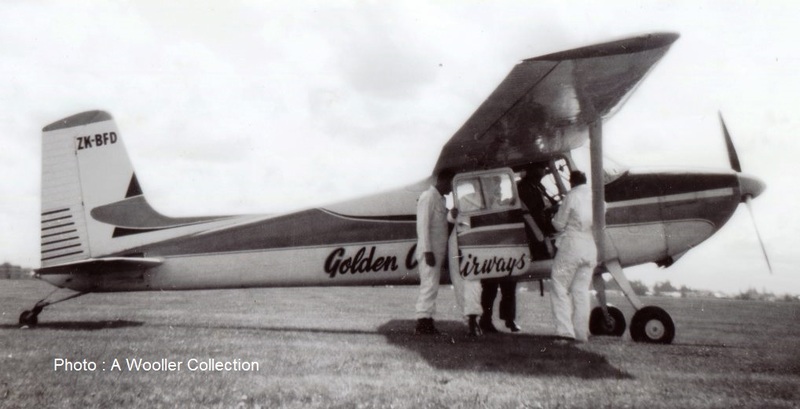 Later that year, on the 31st of October 1963, Bill Evans, the pioneer founder of the company, sold it to Aircraft Hire Ltd of Masterton who renamed it Golden Coast Airlines Ltd.. The new ownership meant one of their aircraft, Cessna 205 ZK-CFF (c/n 205-0412), was at times used on the service. At the end of the year ZK-BVQ went to Phoenix Aviation of Greymouth and the company took over Piper Pa23-160 Apache ZK-BLP (c/n 23-1089) which Phoenix Aviation had used to pioneer a Greymouth-Christchurch service. Piper Apache ZK-BLP taken at Nelson. 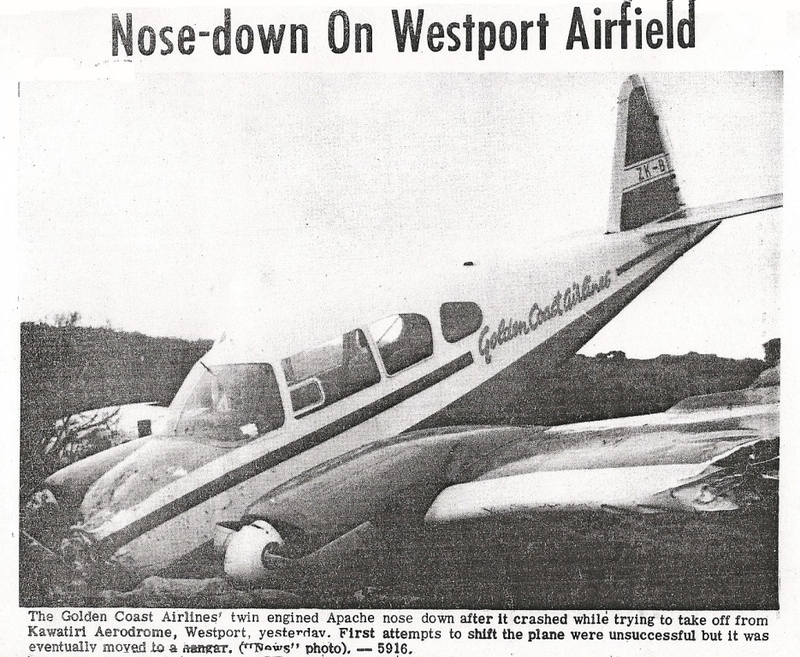 ﻿The company experienced a setback in May 1965 when Apache ZK-BYB suffered a landing incident at Westport. The aircraft having was subsequently sold. 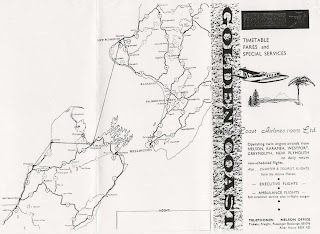 In August 1965 the airline was sold to Nelson businessmen who renamed it Golden Coast Airlines (1965) Ltd. With the demise of SPANZ Golden Coast introduced a Nelson-New Plymouth service on the 23rd of March 1966. The company used their own Apache, ZK-BLP, and the Nelson Aero Club’s Apache, ZK-CHU, for this service. The New Plymouth service was extended to Hamilton on the 14th of December 1966. Nelson Aero Club's Piper Apache, ZK-CHU, taken at Omaka. On the 4th of January 1967 the company introduced Aero Commander 500 ZK-CTM to its services. At this point the Aero Commander was unable to operate into Greymouth aerodrome until it required upgrading for the higher performance machine. The arrival of the Aero Commander also offered the company the ability to operate under IFR conditions. In December 1968 the New Plymouth-Hamilton service was discontinued due to lack of patronage. 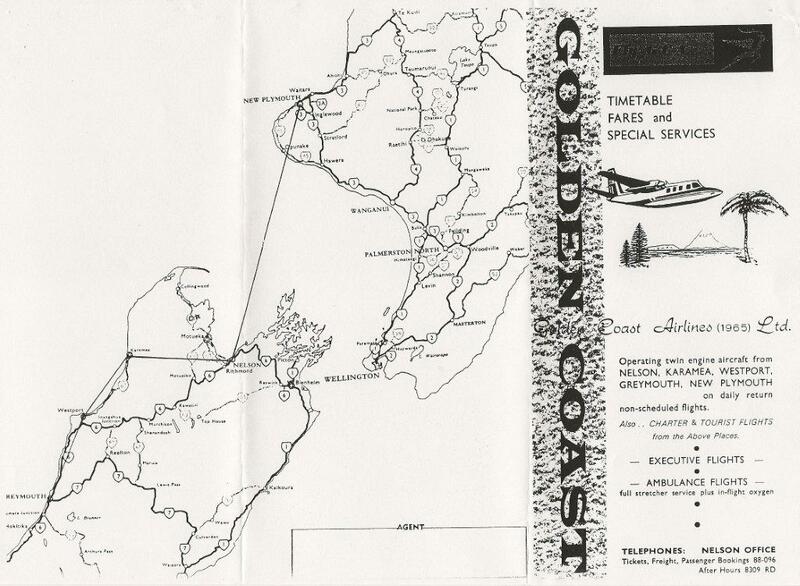 In 1970, while Westport airport was being upgraded for NAC’s Friendships, Golden Coast operated additional Westport-Nelson services, predominantly using the Nelson Aero Club’s Cessna 172 ZK-CGB. By this time the company had lost some contracts and was struggling financially. The Nelson-New Plymouth service was cut in mid-1970 and on the 17th of September 1970 the company ended its services south to the West Coast.